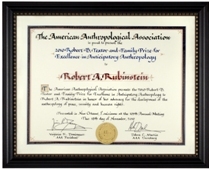 Robert Rubinstein, professor of anthropology and international relations in the Maxwell School, has been presented with the 2010 Textor and Family Prize for Excellence in Anticipatory Anthropology. The Textor Prize, which is awarded annually by the American Anthropological Association (AAA), encourages and rewards excellent contributions in the use of anthropological perspectives, theories, models and methods in an anticipatory mode, which allow citizens, leaders and governments to make informed policy choices, and thereby improve their society’s or community’s chances for realizing preferred futures and avoiding unwanted ones. Rubinstein’s award honors his advocacy for the development of the anthropology of peace, security and human rights. In bringing an anthropological perspective to these issues, his research and publications in medical and political anthropology have anticipated the significance of methods and frameworks for peace and conflict studies in the dynamics of the global war on terror, particularly in Iraq and Afghanistan. His seminal piece in Security Dialogue (2005), “Intervention and Culture: An Anthropological Approach to Peace Operations,” is a compelling and useful work for all scholars interested in peace and conflict. He has important threads in his diverse and prolific career in placing anthropology in the middle of peace and security studies. There are three anticipatory elements in his work in this area: (1) his role in founding and promoting the IUAES Commission on Peace and Human Rights, (2) his early recognition that anthropology was indeed significant to understanding international security; and (3) his efforts to draw the attention of policymaking elites to the importance of anthropological lens to critique peace and stability operations. Overall, his career is a diverse one spanning several continents and multiple problem areas since the 1970s.